Energy Minister Taner Yıldız said on Saturday that technical deficiencies and mine managers and owners ignoring repeated warnings were the main causes behind the October 28 accident in the Ermenek coal mine, where 18 miners were trapped. Search crews have located the bodies of two of the miners who were buried on Saturday, while efforts to locate the rest continue. Yıldız said, "As we dug deeper into the mine, the mistakes committed by the management became apparent. The water leakage from an older tunnel was known. Repeated warnings from miners were ignored and the management decided to dig on six or seven meters below the point of the leakage. This is an egregious mistake." The minister said warrants for the arrest of eight people, including the mine's owner, have been issued. Seven were detained on Saturday and the mine owner, Saffet Uyar, surrendered to police yesterday. Five of those detained are management personnel while the other three are owners. 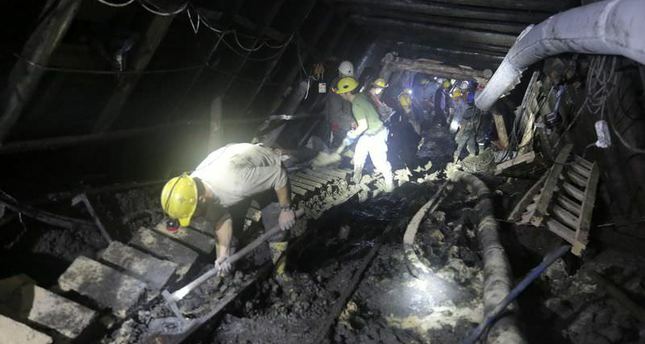 The administrative investigation within the Energy Ministry is continuing, said Yıldız, adding that during the regular inspection of the mine in May, the tunnel where the accident happened did not exist. "If the inspectors are at fault too, they will be punished," he said. He also said search efforts would continue but every meter cleared brought a different set of difficulties and the process is complicated. Family and Social Policies Minister Ayşenur İslam said the families of the eight miners were being looked after and each family was being given psychological support. The initial investigation showed each of the 18 miners were the sole breadwinners of their families and that each family needed financial support. She said the individual needs of each family was being looked into and satisfied in a timely manner.